Everything you need to know about travelling by bus in New Zealand. Which bus should you take to travel New Zealand? Travelling by bus is a super popular way to see the country. So popular, in fact, that there are three different ways travel New Zealand by bus! 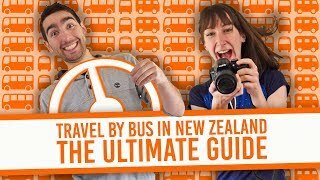 We’ll go through them all extensively in this ultimate guide to travelling by bus in New Zealand! Travelling by bus is not only ideal for the budget traveller, it’s a way travel New Zealand in an action-packed way while getting to meet loads of interesting people. This guide will go through all the ways you can travel by bus in New Zealand, including the pros and cons to each one of them. 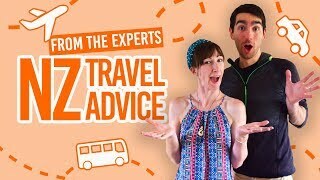 We’ll even give you some quick details on city buses and day tours too, as well as seven top tips for travelling by bus in New Zealand. Our guide below will go into detail about what is involved with each bus option to travel New Zealand. In addition, here are some quick tips for travelling by bus in New Zealand. Buses are never on time in New Zealand but still, don’t be late because they will leave you, that goes for lunch stops on the coach buses too. The most extensive public transport network in New Zealand is the national coach buses. This is the mode of public transport which will get you to most places. Which companies run the national coach buses? The main national coach bus company in New Zealand is InterCity and Skip Bus which is covering the main tourist spots of the Norh Island. [Update: As of the 15th July 2018, Manabus is no longer operational]. Atomic Shuttle is another national coach option running in the Canterbury and Otago regions of the South Island. With national coach buses, single trip tickets can be purchased taking you from A to B. Bus passes can also be purchased, which is a great option if you plan to use InterCity on a regular basis. For example, InterCity do a FlexiPass bus pass which runs on a “travel hours” basis, and they do a TravelPass bus pass which is a bus pass for a set route around the country including a few activities. Find out more in What’s the Difference Between InterCity Backpacker Bus Passes? What is it like to travel by national coach bus? Using the national coach buses are easy. You can book your trip online or with most travel agents and accommodations in New Zealand. The just show up at the required bus stop 15 minutes before the departure time. The bus driver usually asks for a name and booking number (or bus pass details) then you hop on the bus. Bus trips usually involve a couple of 10-minute toilet/coffee breaks, as well as a 30-minute lunch break. Bus drivers give commentary on the speakers along the way and announce when approaching stops (so you’ll know when you reach your stop). The bus doesn’t make any stops for photos or short walks, etc. along the way. Another way to see New Zealand is with a bus tour. This is a guided route around the country with a group, a bus and a couple of tour guides or driver guides. Bus tours come with a lot of inclusions, such as accommodation, meals and some activities. The bus companies that run tours in New Zealand include Contiki, G Adventures, Sweet As Travel, Haka Tours, Stray Journeys, Topdeck and Flying Kiwi. What makes them “backpacker” tours is that they mostly attract young travellers, aged 18 – 30 years old, that are looking for an action-packed trip in New Zealand. How does it work and what is it like to travel with a backpacker bus tour? With bus tours, you have a huge variety of tours to choose from ranging 3 to 24 days. You pay for the whole trip before your chosen departure date, which often includes accommodation in a hostel dorm/tent in a campsite, at least one meal a day and some activities. You also have the option to choose some activity add-ons, upgrade to a private room or cabins, and provide information on any dietary requirements. From there, you travel to New Zealand and usually, tour groups will have an “introduction” evening giving you a chance to meet everyone the day before the tour. Otherwise, turn up at the designated bus stop of meeting place on the trip departure date and away you go! You will have a tour guide or two who will look after you for the whole trip. They will help organise booking for any additional activities you might want to do. Plus, make you aware of each days’ itinerary. They usually prepare the meals or organise to make the meals together as a group. As all tour guides do, they also give commentary as you are travelling through the country. As it’s mostly all-inclusive, it’s the most expensive bus option upfront. Like bus tours, hop-on hop-off buses follow set routes across the country with the option to “hop-off” just about anywhere along the route. Unlike bus tours, accommodation, meals and activities are not included in the price but are run on a more “pay-as-you-go” basis. Which companies are Hop-on hop-off buses? The two main hop-on hop-off buses that run very similar to each other are Kiwi Experience and Stray. Flying Kiwi also allows you the option to hop-off their bus tours for 9-day+ periods. For this guide, we’ll focus on hop-on hop-off as being Stray and Kiwi Experience, but head over to this article on how Flying Kiwi works as hop-on hop-off. How does it work and what is it like to travel with a hop-on hop-off bus? Bus passes for a chosen route are booked and paid for before departure. You can even buy a pass and decide your departure date later (as long as it’s within 12 months of purchasing the pass). When you’re ready, book your departure date and meet your bus at the given location and time. From your departure date, bus passes are valid for one year. For national routes, you are able to complete a route multiple times with a few conditions. You will meet your driver guide who is your driver, tour guide and travel agent, where you will give your name and/or passenger number to get on the bus. Throughout each day that you travel with the bus (as opposed to the days that you hop off and do your own thing), there will be plenty of toilet/refreshment stops, short walks, photo stops, supermarkets and more. Clipboards will go around the bus to sign up to accommodation choices and activity choices (if any) that you want the driver to book and organise for you. Accommodation is usually hostels with communal kitchen and lounge facilities. You pay for your accommodation and activities on arrival to said accommodation or activity. Because meals are not included, you have the choice to eat out (if available) or cook in the hostel kitchen with food you would have bought at the supermarket stops. 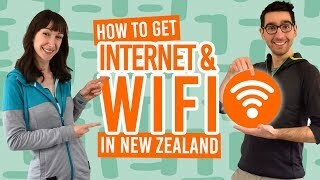 If there’s anything we’ve missed in this explanation, it will probably be in How Does the Hop-on Hop-off Bus Network in New Zealand Work? Best of both worlds in terms of stress-free tour bus-style travel and choice to be more independent by hopping off the bus, choosing your own activities and accommodation. They are action-packed tours, while you have the option to slow down by hopping-off the bus. It can get quite expensive through paying as you go. You need to be quite strict on yourself on what activities to be involved in if you are on a tight budget. The term & conditions of travel can be a little cloudy with some locations not allowing you to hop off, as well as their “unlimited travel” policy. That is explained more in the video over on our What is the Difference Between Stray and Kiwi Experience page. During the busy summer season, it can be hard to get yourself booked onto the next available bus when buses are full or book extra nights in accommodation more spontaneously. New Zealand’s larger cities have their own bus networks to connect the suburbs with the city centre. Check out some of our public transport guides for more information. City buses provide a cheap way of getting around the city. You pay for one-way tickets which are usually priced on how many “zones” you pass through. 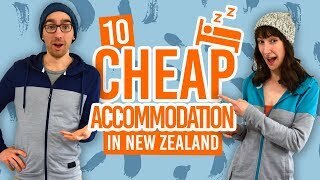 For those of you staying in a city for a while, perhaps working on a working holiday visa, then you might want to consider getting a travel card for discounted fares, such as the AT Hop for Auckland, Snapper Card for Wellington, Metrocard for Christchurch, Connectabus for Queenstown, etc. Some tours in New Zealand involve tours by bus. These tours usually involve activities and food. The most popular day tours by bus are trips from Queenstown to Milford Sound and Cape Reinga tours. These are booked as an activity rather than a mode of transport. For more information on booking activities, see here.